The corruption of the director would become well known with the people of France and cause them to hate the system with a passion. Had the directors been able to fix the economy, the people may have been more accepting of the lack of freedom, but this was not the case. When Abbé Sieyès became the new director he was convinced he had to fix the problems in the Directory. He was one of the few people who had managed to stay popular during the entire French Revolution, mainly because he had stayed out of politics almost completely during that time. He used this popularity to gain power and now wanted to end the directory in favor of a new government. Sieyès planned to deploy troops in Paris to force the directors to resign and use this military power during the change of government. His plan obviously hinged on having a strong command of the military, but he had no military background. He would choose to add Napoleon to his plans because he was a young, good looking military leader who had already shown he was good at politics. Unfortunately Sieyès overplayed his hand in this, not realizing that the key to his plan was the military and not his own personal popularity. dictatorship, hoping to cause his troops to turn on him and end this issue. 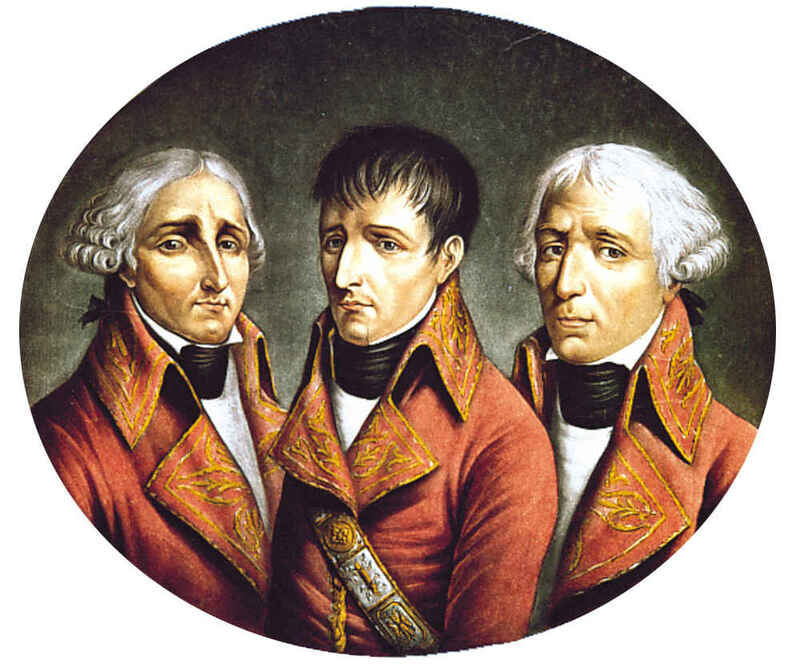 Fortunately, Napoleon’s brother Lucien was the President of the council and officially took Napoleons side, claiming he would kill Napoleon himself if he tried to take over as King. Most of the council would flee after this, and the few who fought back were killed by the army. Shockingly, the people of France didn’t riot over this show of force, they hated the directory and seemed to be tired of the riots too. The leaders of the Coup would create a new government known as The Consulate (1799-1804) under the newly created “Constitution of the Year VIII.” They would create a republic with both an executive branch (consuls) and a legislative branch. The 3 consuls were give a great deal of power to make decisions and were elected to 10 year terms, which gives them time to implement new ideas. The legislative branch was separated into 3 parliamentary assemblies that separated the power of making the laws, but this was their only role. The fact that this new government was named the Consulate (a name that derived from Roman history), became ironic as time passed. Since Napoleon knew his history well, he simply saw this as history repeating itself, and prepared to take over power just as people had in the Roman triumvirates. There was a great deal of voting that needed to be done in order to fully implement this new government, and Napoleon found ways to rig the voting to his favor. The Constitution would pass with a fantastic approval rating of 99% and would make Napoleon the 1st Consul, giving him the most power of the 3. At no point did anyone think that he may have rigged the voting for his own benefit at the time, despite the impossible percentage who approved it. This vote gave Napoleon control over the country along with the control he had over the military, making him a sort-of dictator within a system that was supposed to be a republic. Napoleon’s extreme amount of power would to the benefit and to the detriment of the country, depending on the situation. His control over the government and the military would bring relative peace to the country and the standards of living went up dramatically, making him very popular among the people. He used his popularity to create new taxes, an idea that would have been absolutely unheard of in previous years. On the other side, he would get rid of anyone who said anything negative about him by sending them into exile. Military commanders and government officials would often be sent into exile, even for things that could be seen as positive. Many military leaders complained that he was too willing to risk the lives of his men, even when the benefits of doing it weren’t that important.